Before we get to the profile of The Fine Art Society, let me introduce Conor Davies, the Music Court’s newest contributor. Davies will cover a diverse assortment of music, and, tonight, he has for you a band out of Derby, England. Please help me welcome Conor to the blog! The East Midlands is a pretty fruitful region in terms of music nowadays. Leicester has Kasabian, Nottingham Jake Bugg, Indiana and Sleaford Mods, but Derby? Not a lot comes from Derby. That’s not to say there isn’t a thriving music culture in the city, one of 2015’s biggest breakthrough act Slaves put part of their success down to touring cities like Derby extensively. Aiming to add to the esteemed list of acts preceeding them are The Fine Art Society, an indie-rock trio from the city. The trio as it is right now consists of guitarist and vocalist Matt Turner, bassist and vocals Ben Marshall and Max Chambers on the drums. TFAS specialise in shouty vocals and catchy chords which when following some intriguing drumming beats, creates some fulsome slices of rock and roll. The band have been active since 2011, gaining pace and accruing members, but Turner and Marshall have been there since the beginning, and 2015 has seen the two fully focus on pushing the name of their band. They’ve played countless venues and festivals around the region over the years, sometimes playing to a man and his dog, other times filling dancefloors and creating raucous atmospheres. Kicking off with your lead single is generally a ballsy move, but ‘Omegle’ has recently been given a glossy, comedic music video (see below), and it seemed only right for it to be the opener. The song pretty much sums up what the band are about, with frank lyrics, that cut directly to the point, and some extremely catchy guitar riffs backed up by tight drumming. One of the things I admire with the band is their ability to tell a story within 3-minute tunes. They’re often comedic in nature, and you wonder what adventures they’ve been on to influence the song-writing experience! 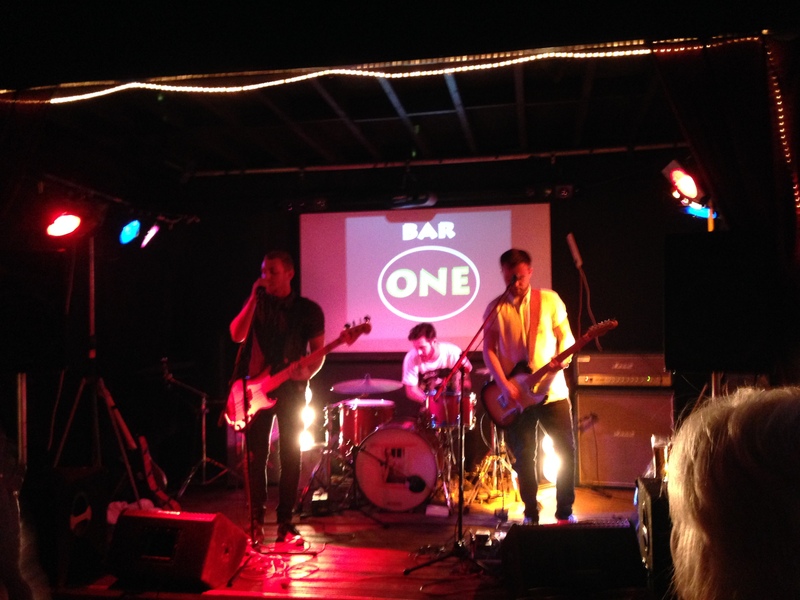 With the night being the launch of their EP, ‘For Old Times Sake’, ‘Omegle’, ‘Plaything’ and ‘Sadie’ were all strong high points of the night. Most importantly they offer enough of a musical variety in terms of the music compositions for newcomers to the band, ‘Plaything’ is probably a song most young people can relate to, with tales of ‘borrowing a couple of quid from a mate’. Another point of note is the band’s decision to delay the release by three months to allow them to master the recording process perfectly, and you can really see the fruits of the labour that must have gone into the process. ‘Sadie’ is a bit seedier, keeping in tone with the subject matter of the song, but the rawness of the drums and the catchy ‘woah’ vocalisation fit perfectly for the song. Turner’s vocals are strong and guiding as usual, with his throaty rasping quality Frank Turner-esque in its qualities. The band decided to throw in some covers, most notable among them were their renditions of Outkast’s ‘Hey Ya’, Fleetwood Mac’s ‘Go Your Own Way’ and the unique mash-up of Taylor Swift and Stereophonics ‘Shakota’. The last one in particular is an ingenious combination of ‘Shake It Off’ by Swift, and ‘Dakota’ by Wales’ famous sons, which is insanely catchy, proving to even the most ardent Swift hater, that she can write some damn good pop tunes. But aside from showcasing other artists work, TFAS also showed off some of their ‘oldies’, as much as a band with a 4-year history can have ‘oldies’ anyway! ‘Long Walk Home’ stands apart in the live environment for many reasons. A) it is one of the fewer slower tunes, with an ability to get a crowd swaying and bobbing their heads B) it’s melodically terrific and shows the lads are musically talented in more ways than their louder songs, such flexibility hints at a bright future. It may be about partying, yet again, but is a much tender tune and does all the well for it. ‘School Days’ and ‘Ticking Clock’ round off the list of original tunes, and take us back to more familiar territory, with yet more humourous, catchy compositions. By their own admission, The Fine Art Society aren’t at their most complete yet. They’re a band halfway through a big year, their biggest to date, but they have much more promising milestones to come and achieve before they can raise a light to their East Midlands counterparts. But you just get the sense, if they keep working three gigs a weekend, and keep plugging away, they’ll certainly be able to achieve a certain level of success in the not too distant future.